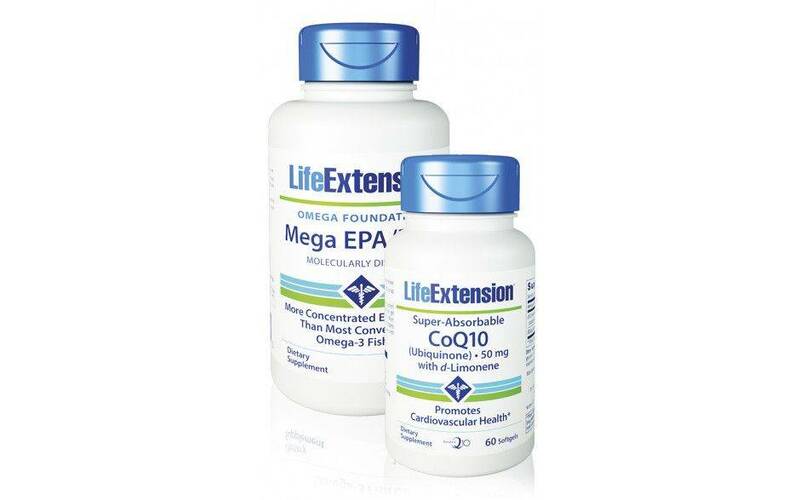 Mega EPA & CoQ10 - A perfect combination for a healthier life. CoQ10 is a supplement for healthy cell function and is required to convert the energy from fats and sugars. 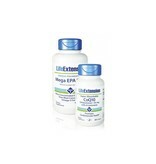 Mega EPA is a molecularly distilled product containing twice as much omega-3 fatty acids (EPA and DHA) as most commercially available capsules..
A giftset with two very popular supplements that both support cardiovascular health. Coenzyme Q10 (CoQ10) is an essential component for healthy cell function and is required to convert the energy from fats and sugars. However, the production of CoQ10 in our body declines as we age and we need to supplement the daily need. That is because in sufficient quantities it helps the cells work efficiently and protect proteins, lipids and DNA from oxidation. Omega-3 fatty acids, found in cold-water fish (and fish oil), perilla and flaxseed oils, are essential elements of a healthy diet. Your body needs fatty acids to survive and is able to make all but two of them: linoleic acid (LA), in the omega-6 family, and alpha-linolenic acid (ALA) in the omega-3 family. These two fatty acids must be supplied by the diet and are considered essential fatty acids (EFAs). Most citizens in Western nations consume far too many omega-6 though, and not enough omega-3 polyunsaturated fatty acids. The Mediterranean diet known to be rich in omega-3 and monounsaturated fatty acids found in olive oil, some fruit, vegetables and herbs, is recommended as it is associated with cardiovascular health and increased life span. The molecularly distilled MEGA EPA/DHA supplement contains twice as much EPA and DHA as most commercial fish oil capsules. Other ingredients: polysorbate 80, gelatin, ethyl oleate, glycerin, purified water, carob color, d-alpha tocopherol, rosemary extract.